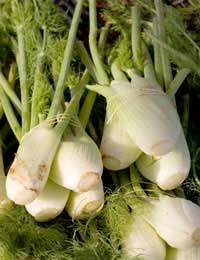 With its chunky bulb and armoury of stalks fennel is one of the more alarming vegetables in terms of appearance. It is probably for this reason that a great many cooks find it rather intimidating. But the subtle, sweet aniseed flesh is in pleasing contrast to its aggressive exterior so it is worth taking the time to appreciate its inner beauty. Whichever way fennel is utilised in the kitchen, its subtlety requires that it is not utilised in recipes where it has to compete against any domineering ingredient - otherwise it will not be allowed to make a valuable contribution to the finished dish and simply fade away into the background flavours. When and How to Use Fennel? So, on a practical level, how should the vegetable be processed? Simple - top and tail, reserving the green fronds to use either as a garnish or to bring a note of aniseed to a green salad. Then simply slice the bulb thinly in a vertical direction and either braise, break down as part of a sauce, or eat raw. For a more concentrated flavour, the seeds can be used, for example in a stew or incorporated in sausages as is the practice in a number of the regions of Italy. A variety of fish seem to go swimmingly with fennel, either baked in parchment paper so that the vegetable softens in the juices of the fish, or prepared separately. Prepare four good sized bulbs using the method describe above and lay in the bottom of a shallow casserole dish. Pour over 500ml of white wine, cover with kitchen foil and bake in an oven heated to 160°C for 30 to 45 minutes during which the alcohol from the wine will evaporate. Test the fennel with the point of a knife to ensure it is cooked through, then add 250g of butter and a generous amount of freshly grated parmesan cheese and return to the oven for a further five to 10 minutes. Adjust the seasoning to taste and garnish with the fennel fronds finely chopped. As well as fish, a side dish of this baked fennel would work well with grilled chicken, too. The fronds also provide the finishing touch to a plate of spaghettini or linguine tossed in a simple fennel and cream sauce. Add salt to taste in addition to some freshly ground black pepper and toss the sauce with the pasta of choice, finishing with some parmigiano reggiano and the aforementioned finely chopped fronds.